Everyone has their own Glastonbury experience. 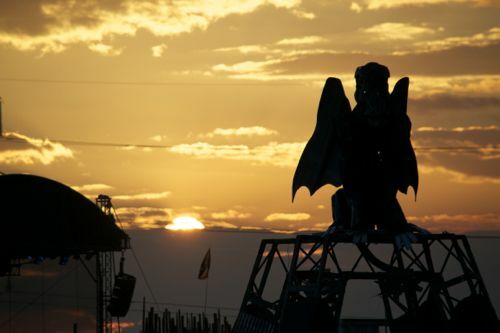 It’s so vast, with 200,000 people and thousands of acts scattered across two large Somerset farms that this giant muddy city is able to offer something for everyone. There are those that like the big name acts of the Pyramid and Other stages, some who can dance all night at Shangri-La and Arcadia and then there’s some like me who enjoy finding new bands and watching music in the many smaller, more intimate venues. I was attending this year as a judge for this year’s Glastonbury Emerging Talent Competition so was especially keen to catch up with some of the finalists. During this review I’ll cover each of my day’s trek around the storm hit, mud strewn site’s smaller venues to bring some new acts to your attention. After discovering it was Kaiser Chiefs not my dream of Prince playing the surprise slot opening at The Other Stage I headed to this year’s best venue, William’s Green, where new bands rub shoulders with more established acts looking to play a second, more intimate gig. Ralfe Band were first on and provided the perfect start with Oly Ralfe’s accomplished Baroque pop on keyboards and acoustic guitar putting in great versions of tracks such as Crow and Ox. As I made my way over to the BBC Introducing stage I stopped off to watch a little of Blondie. I knew it would be a soul destroying experience for this fan and was proved right. Debbie Harry, Chris Stein and one of the world’s best drummers Clem Burke remain from the original line up but they were supplemented with some rent a rock session musicians and were now very clearly a spent force. Harry shouted rather than sang her way through the classics like Hanging on the Telephone and their bland ‘new ones’ were met with groans and sighs from the crowd. Is it time to call it a day? In Blondie’s case, definitely. Over at the BBC Introducing stage Dan Hyde proved a welcome antidote, backed by cello and giving a new take on the skinny jeaned young singer songwriter genre. Derry’s Wood Burning Savages were next and immediately looked like a band destined for bigger things. Every track in their short 20 minute set of fast paced indie rock sounded like a single, especially Lather, Rinse, Repeat. 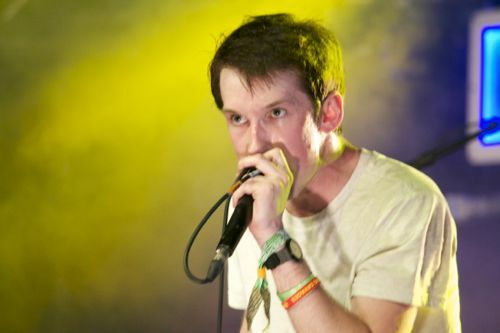 In singer Paul Connolly they also have a great frontman; part Bono, part Danny Kendall from 1980s Grange Hill. 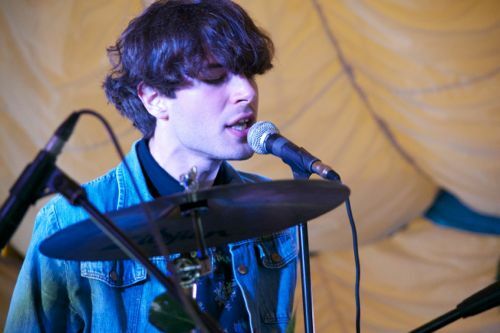 Carnabells from Leeds were next at BBC Introducing and were brought on stage by fan Steve Lamacq. All giant hair, paisley shirts and velvet jackets they play rock and roll with a huge dollop of indie rock and did Steve proud. 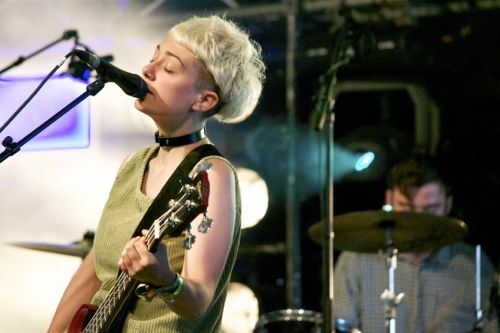 The beauty of the BBC Introducing stage is it is next to the Gully Outer National stage for world music as well as John Peel for the more established BBC 6 Music style acts. Birmingham’s Eternal Taal – Bhangra Entertainment Team were hard to ignore with their energetic crowd participation act at Gully as were Temples over at John Peel with their carefully crafted late 1960s psychedelic rock. It’s a little Tame Impala light but they still do this genre justice. Following a brief burst of sunshine some menacing clouds began to appear. I sought shelter back at William’s Green to see We Were Evergreen. Anyone who has heard Canada’s Rural Alberta Advantage will be impressed by this smart, Parisian electro pop act. 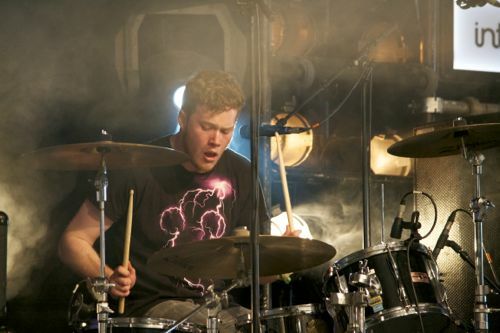 The next event was the weather, with a truly frightening electrical storm bringing the festival’s music to a brief close due to health and safety fears. Everyone at the festival will have their tale to tell of where they were when this intense rain came down. For me it was in The Leftfield where Neonfiller.com favourites The Tuts were just getting going in their punk pop set when the generators were shut down. Billy Bragg, who is curating proceedings at The Leftfield apologised but audience didn’t care though as they launched into a Cliff Richard at Wimbledon style sing-along to Bohemian Rhapsody. The guitar solo bit was particularly funny. Back at William’s Green and the electricity back on, Young Knives played a storming set, filled with tracks from Neonfiller.com top 20 album of 2013 Sick Octave and an incredible performance from lead singer Henry Dartnell as he snarled, barked and jerked around the stage. 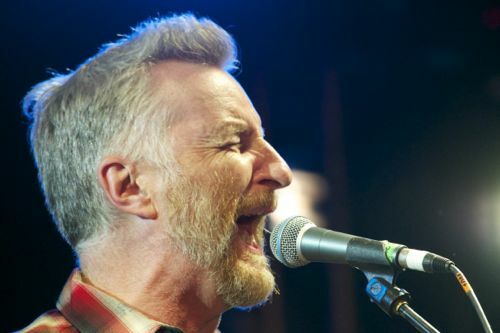 Billy Bragg’s Friday night Leftfield show is a tradition of the festival. Tonight it was just him and telecaster and acoustic guitar, belting out his hits and reminding us of the late Tony Benn, who was a regular at the festival. It’s a political venue so the politics is ramped up through tracks such as Between the Wars and There is Power in a Union. But he’s also a preacher with heart and Handyman Blues about his father was among many tearjerkers. Bragg always puts on a good show, but there’s something special about his Friday night Leftfield slot. My evening ended with two Somerset based bands, Flipron and Nick Parker and the False Alarms who share members and played a great joint set at Avalon Café. 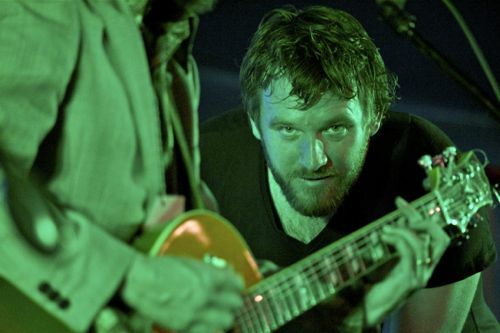 Both Parker and Flipron frontman Jesse Budd were playing a number of times at the festival but you’d never know they were probably wrecked from exhaustion as they belted through their most festival friendly tracks. There was even dancing amid the tea drinking. John Peel openers Black Tambourines were one of the Glastonbury Emerging Talent competition finalists this year and left me impressed during their short set at the Pilton finals in April. It was great to see a full set from this Falmouth act, which owes a lot to the 1960s garage punk and mod sounds of the Unrelated Segments and other obscurities from that era. At BBC Introducing by coincidence another Falmouth act, Polly Money, is proving that the Cornish music scene is in fine voice. Her intricate acoustic guitar work and looping vocals show she is another accomplished, emerging talent. After a surprise gig at BBC introducing from Little Dragon I headed back over to William’s Green for the billed psychedelic rock segment of the weekend, which started with the Nirvana-esque grunge-sters The Wytches, Brisbane’s Blank Realm, Smoke Fairies and Dinosaur Jr’s favourites Bevis Frond. All these William’s Green acts were great in their own separate ways from Smoke Fairies’ style of dressing in designer white outfits, Bevis Frond’s love of life, Blank Realm’s insane vocals and The Wytches massive hair. The evening was spent in the company of two great songwriters. Watching Nick Lowe sing What’s So Funny About Peace Love and Understanding with his perfect pitch and intonation is one of those ‘things to see in music before you die’ moments. He was especially suited to the beautiful Acoustic tent with its hanging red drapes and giant disco ball. 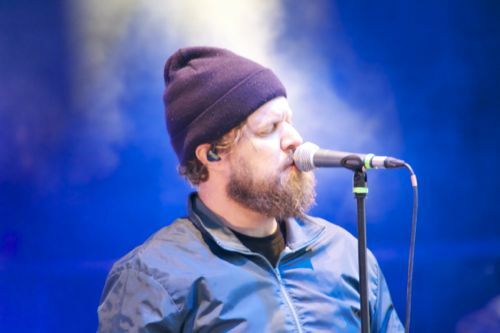 John Grant at the Park was as amiable and fun as he appears to be on disc, with his clever lyrics and liberal swearing. As joints were being passed around at the front Grant dazzled us with tracks such as Mars and GMF, perhaps his greatest song. 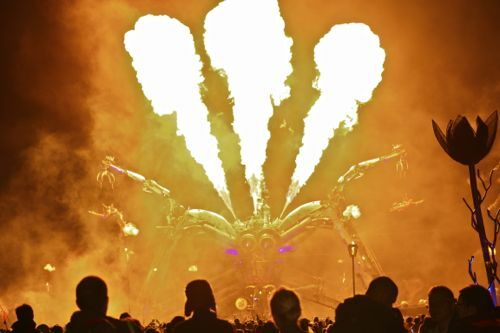 On the way back home that night (I live near the site and was popping in each day) I managed to catch the Arcadia landing show, an outstanding spectacle of fire breathing giant space spider pyrotechnics. The Black Tambourines and Wood Burning Savages prove the festival has emerging talent that has seemingly arrived fully formed. 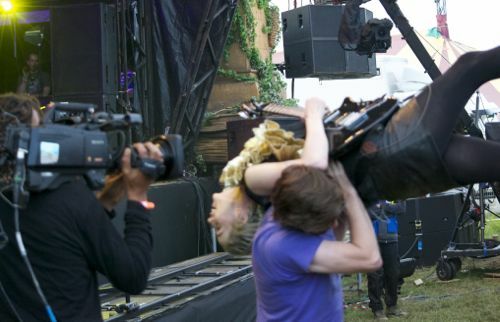 But some of today’s BBC Introducing stage acts showed that some have a little way to go in terms of stage presence. Glastonbury Emerging Talent finalists FURS have the right look and sound but fell into the trap of not looking like they wanted to be there. Kagoule have their chops around a distortion pedal but while excellent musically they looked nervous and were smile-shy. We are told by the BBC DJ who introduced singer songwriter Lapsley that she will be one of those acts that will be making a swift move from the BBC Introducing to a main stage swiftly. It does happen, with Ed Sheeran playing the stage in 2011 and bagging a Pyramid slot this year. Lapsley could do well with her haunting electronica. She has some nice touches to her act as well, especially through voice manipulation gadgets. But she’ll have to do a lot of work on her stage presence to follow Sheeren’s lead. She looked like she was on work experience at an office, desperately trying to pluck up the courage to ask a manager where the coffee machine is, rather than at a music festival. Gallery Circus though showed these acts how it should be done. This Newcastle duo of twins Graeme and Daniel Ross play sibling blues rock in the White Stripes vein and are sensational live; Graeme’s frantic drumming especially. After seeing the energy they put into playing live I want them to get wider attention and a main stage slot that so many on the BBC Introducing are touted for but today only Gallery Circus deserve. After the storms of Friday and Saturday the mud was thick and getting about the site was tough work. I decided to stick to one area for the duration, even if that meant missing the Festival’s buzz act Dolly Parton. The Park was my venue and provided the best segment of the festival as well as the best live act I’ve seen since Nick Cave’s astonishing Pyramid Stage set in 2013. Phosphorescent brought the songwriting talents of Matthew Houck and key tracks, such as Song For Zula and Ride On/Right On from his Neonfiller.com Top 20 album of 2012 Muchacho, to the Park. He had a little wobble early on, having a hissy fit with a mic, slamming down the stand in disgust. Perhaps realising that this made him look like an utter knob he backtracked, thanked the sound engineers for their hard work and the gig resumed. Ahead of next act Yoko Ono with Yo La Tengo I popped up to the Rabbit Hole, the crazy bar near the Park’s ribbon tower to catch a second gig from Glastonbury Emerging Talent winners M+A. Their blend of European pop and electronic trickery was superb in this tiny venue and they proved worthy winners of this competition. 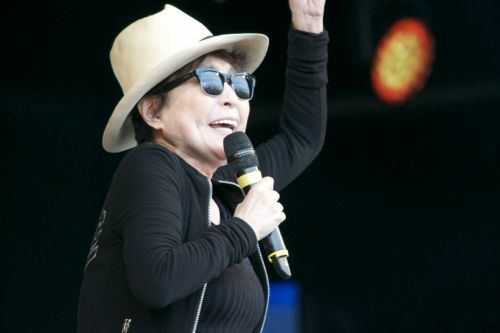 I was not expecting Yoko Ono to be good. I was mostly there for the novelty of seeing such an well known figure of modern culture and had always been of the opinion that her and Lennon’s preaching was more pretentious than heartfelt. There was pretension, but she is such an engaging personality I can see why so many listened to her and husband back in the day. Before she came to the stage people with flowers in the hair went around the crowd handing out labels to write down wishes and hand back in a bucket. Then Ono arrived, tiny, focused and full of smiles backed this time by Yo La Tengo as the Plastic Ono Band. Packed full of tales from her own life, including the tragic loss of her daughter due to a marriage break up and artists visiting her and Lennon, the audience immediately warmed to her. Musically it was pretty fine too. 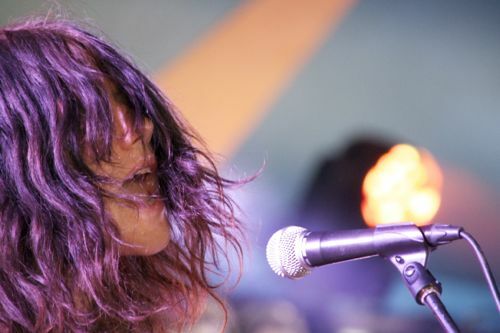 Backed by Yo La Tengo’s indie rock, Ono throat warbled her way through tracks such as We’re All Water and Mind Train as the audience beamed back at her. St Vincent provided one of the most astounding show of the weekend. Looking sensational in gold trimmed black dress and stiletto boots she moved around the stage like a android doll that is smirking as it discovers rebellion and music for the first time. Coordinated dances with the band, a move onto a giant white pedestal, a coordinated roll back down it and two of the most insane crowd surfing moments I’ve witnessed then followed. The crowd surfing was particularly impressive, still playing guitar she struggled through the mud in her heels, had to be helped up by security staff, fell over a number of times, jumped on people, managed to borrow a flat cap and then popped back on stage still in android doll character as if nothing had happened. How she managed to still look cool after that I’ll never know. Your Lips Are Red and a tender version of Prince Johnny were among many highlights of an incredible masterclass in performance and music for some of the emerging acts here to take note of. To see more photos from the weekend head over to our Facebook page. 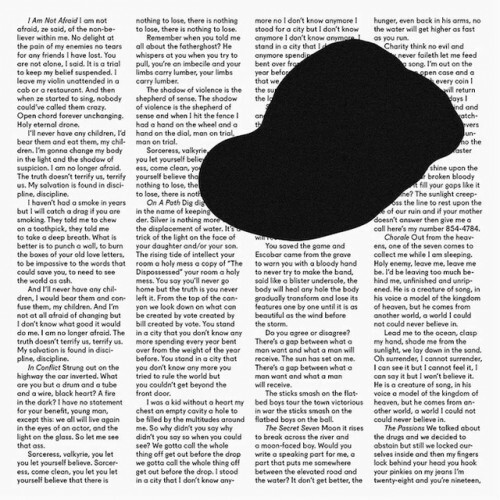 Heartland, the 2010 debut album by Canadian multi-instrumentalist Owen Pallett and first since he shed his Final Fantasy moniker, blew us away. It’s epic subject matter of a fantasy world of violence was packed full of gorgeous melodies, dramatic lyrics and superb orchestral pop. Lyrically and musically In Conflict is a different beast. 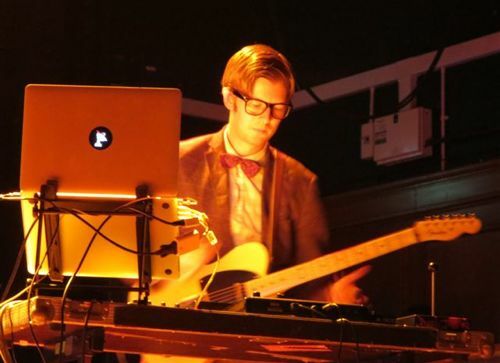 Following a tour with The Mountain Goats’ John Darnielle, who specialises in autobiographical lyricism and story telling, Pallett has taken a more personal approach. Gone is the fantasy kingdom of Heartland that the fictional god Owen Pallett oversaw and in are stories and emotions direct from the modern day, Earth based man himself. With this more personal focusthe music needs less drama. There’s still epic flourishes and touches but on the whole its Pallett’s voice that is given more space and vocally he sounds great here. There’s also less violin looping and trickery too, with Pallett happy to let synths and a strong section take the strain. This gives it an ever so slight 1980s feel, with some tracks reminiscent of acts such as Depeche Mode or Soft Cell. I Am Not Afraid even has a wonderful David Sylvian Forbidden Colours moment half way through. On a Pathway and In Conflict are also great electro pop and the horns on Chorale are superb. As Pallett moves further out of the shadow of his former stage name, which he abandoned for copyright reasons, his career and incredible ear for interesting pop continues to progress. 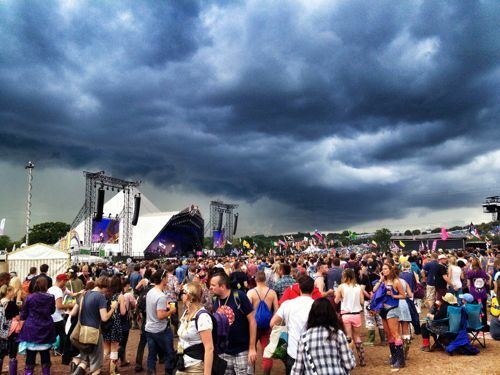 Glastonbury Festival goers are being urged to brace themselves for rain showers over the weekend. According to the Met Office a prolonged dry spell in the central Somerset location is set to break on Thursday afternoon when showers are predicted. 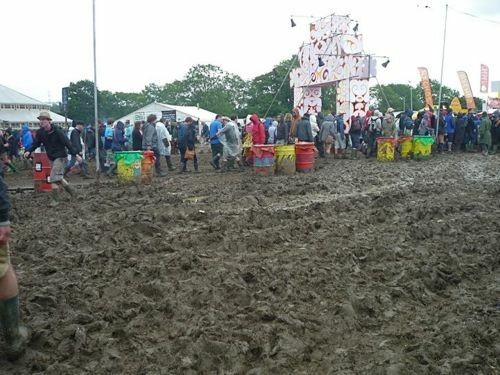 Glastonbury 2011’s mud. Will it return for 2014? Thursday night should be clear but further showery spells and sunshine are predicted all day Friday. Saturday and Sunday are set to continue Friday’s trend of sunshine interspersed with showery spells. Friday looks to be the wettest day, according to predictions this week. Temperatures are set to be around 20 degrees Celsius. 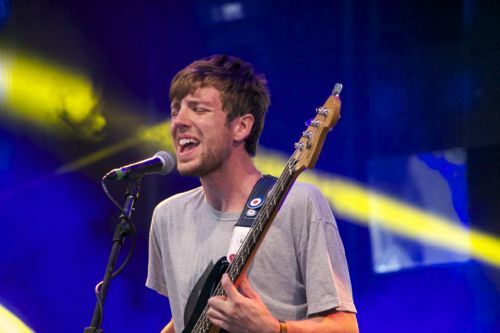 To see our Top Ten highlights for Glastonbury 2014 click here. We will be attending this year’s event and posting a review next week. 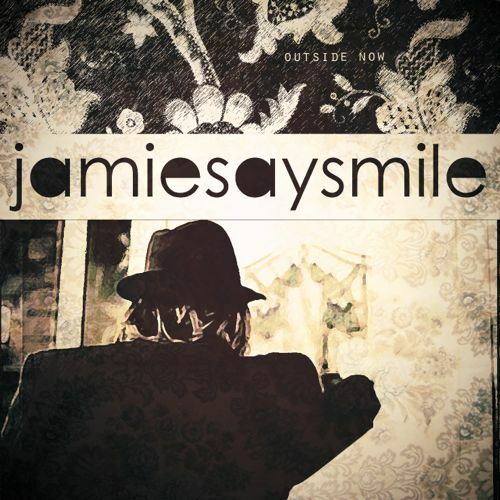 Another summer, another EP from Yorkshire singer songwriter Dan Hayes, aka JamieSaySmile. Over his previous two EPs, 2012’s Day Three and last year’s Grand Authentic Stage, Hayes has veered between a solo acoustic guitar sound and full band production to showcase his big Bob Mould-esque voice. He’s been seemingly restless between the two sounds and indeed the rock and folk genres that are his influences, unsure which to settle on at times. Here, however, he’s found a way of combining both and nearing something that could be the start to a deserved progression in Hayes’ appeal. The combination is simple, of keeping a solo intimate feel but bringing in a full band at just the right emotive moments to enhance his swooping choruses and strong vocals. Highlights on this latest release include Thirty, which starts off like something straight off Bob Mould’s debut acoustic focused album Workbook, before morphing into something more modern and radio friendly. Pictures and Do You Mind If are other standouts. After three EPs over the last three years Hayes seems to be at last finding his feet with a sound that best shows off his songwriting talents. An album must surely be on the cards soon. The Alternative Top 40 is a monthly music chart shared across multiple music blogs, and a great way of discovering music you might not have heard elsewhere. We are delighted to be among those blogs involved in sharing this list, which is created from nominations from you and compiled by the website Universal Horse. 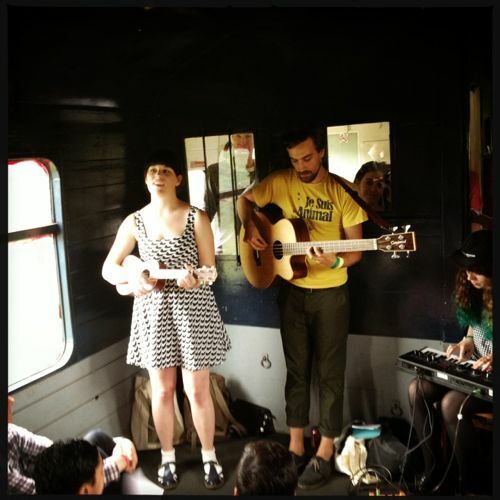 The last time I saw Owl and Mouse perform was in a railway carriage at the Indie Tracks festival on a sweltering July 2013 afternoon. The carriage was packed and the sweat- soaked crowd of around 50 or so were left enthralled by this friendly band that is focused around the intimate vocal delivery and melancholy lyrics of Australian born, London based singer songwriter Hannah Botting. Using the template Allo Darlin’s Elizabeth Morris perfected on her track Tallulah, Botting’s delivery and subject matter are beautiful and sad in equal measure, especially on this EP’s standout track Don and Anna, about the hopelessness of the relationship between Mad Men’s Don Draper and his wife on paper Anna. I remembered it instantly from their Indie Tracks performance. This is their first full EP from Owl and Mouse, following a couple of single releases and certainly has a nice full band feel, with bassist Tom Wade handed vocal duties on Western Skies, written by Botting about homesickness and further echoing Morris’s Tallulah. Don’t Read the Classics is arguably the saddest of the quartet of tracks, unsurprisingly given that their press release tells me it is about the ‘rollercoaster of trust and subsequent disillusionment.’ The lyrics are harsh to say the least and takes the whole ‘divorce/break up’ song to new levels of bitterness, vulnerability and sadness. There’s someone out there who wronged Botting and is surely feeling more than a little sheepish right now. Less is more is a key feature of the Owl and Mouse sound, especially on final track Terrible Things, which was previously available on last year’s Indie Tracks sampler. It’s wonderfully simple, with mainly ukulele and subtle keyboards from Emma Winston, who is also a regular with Darren Hayman’s band and Enderby’s Room. This gives Botting’s vocals added intimacy, which is crucial for a song like this. Across the four tracks there is enough to show great promise and prove that Owl and Mouse grabbed a justified place on our bands to watch out for in 2013 list. But not all four tracks work. Botting’s strength is creating three minutes within a song where she and the listener feel like friends. On Don and Anna, Terrible Things and Western Skies that comes across clearly as the listener is drawn in by her whispering delivery. It is hard not to form a bond with her. But on Don’t Read the Classics the lyrics feel just that little bit too personal and its lack of subtlety jars with the other three tracks, threatening to break the nice illusion of friendship that Botting and Owl and Mouse had so expertly created over the rest of the EP. Luke Haines loves a concept album, his last three solo albums all being concepts and his interest in such things dating back to the Baader Meinhof album in 1996. So it makes perfect sense for him to devote an evening songs from his excellent New York in the 70s album, released last month, and his seminal response to the terrorist Red Army Faction. Haines is a very well respected recording artist, whose reputation for misanthropy and bitter barbs has served him much better in recent years than it did when he was making a play for pop stardom with The Auteurs. He is perhaps less well known for being a top draw live performer and a pretty handy guitar player. In classic power-trio mode he is backed by a tight bass and drums section and together they sound pretty great all evening. The songs from his most recent album may divide the critics (even on this site) but they are punchy live and are arguably improved when separated from the deliberately hissy 70s production style. All the songs work well tonight but ‘Jim Caroll’ (my favourite song from the album, with some of the best lyrics) sounds particularly good, with ‘Cerne Abbas Man’ coming a close second. The Baader Meinhof section of the evening manages to be even better, and sounds incredibly fresh for a 70s themed songs originally recorded almost two decades ago. It is an incredibly cohesive record, so it is hard to pick out any songs that are better than the rest from this set, but the opening trio of ‘Baader Meinhof”, ‘Meet Me at the Airport’ and ‘There’s Gonna be an Accident’ is pretty hard to beat. After the main set ends Haines returns to the stage solo for acoustic renditions of three songs, one apiece from each of his other recent solo records. Fans of The Auteurs even get a brief treat as he inserts a long section of ‘Junk Shop Clothes’ into the middle of ’21st Century Man’ right after the lyric “I was all over the 90s, I was all over in the 90s”. After the end of this set the band returns again for one last song. Repetition is one theme of New York in the 70s album so there is no little humor in them playing ‘Lou Reed Lou Reed’, the albums most repetitive song, for the second time. The crowd don’t mind, we’ve been treated to enough high quality music for one evening and Haines is aloud that last indulgence. A rock and roll one off playing a gig that must be up there with the best of his career. 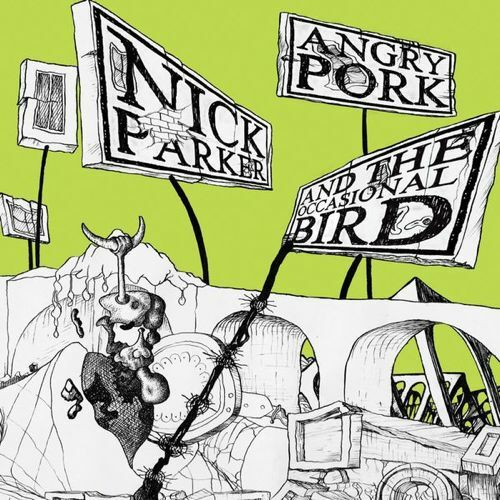 At its heart this second album from Somerset based singer songwriter Nick Parker is folk. But dig deeper and there’s a far broader range of styles on offer, from alternative indie pop to stadium-sized, get your lighters out, rock. Production from Twin Falls man Luke Stidson helps the alternative indie feel and with a collection of local musicians and friends in tow the album also has a warmth to it. In places those taking part even steal the limelight, such as guitarist and harmonium player Dave Little whose country twang brings to life opener Could We At Least Try. Singer Beth Rowley is another talent given room to shine and provides a star turn on the melancholy Oceonographer. Parker and Stidson clearly know how to get the best out of a range of musicians with Clare Tarling’s fiddle playing deserving of praise for highlighting some fine melodies in the songs but never veering into the clichés of Irish folk/rock, that are thankfully avoided on this album, even though on Never Been To Dublin Parker admits to adoring that genre. 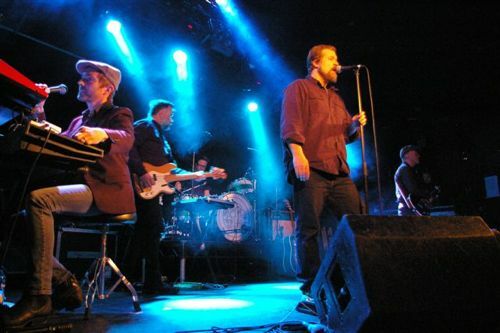 Another musician involved is Billy Shinbone, the alter ego of Flipron frontman Jesse Budd, who brings not only banjo but some fine 1950s style lead guitar work to elevate songs such as Jerusalem. The collection of tracks here are those Parker has been gigging across the UK and Europe for much of the last year. But while the stomp of up tempo tracks such as I’ve Never Been to Dublin Before and the stadium rock bombast of Another Journey Home are sure to be crowd pleasers on stage, it is the sadder, more atmospheric tracks such as Oceonographer, Come on Jump Over Your Shadow and Something Someone Said where Parker’s writing really shines on disc. 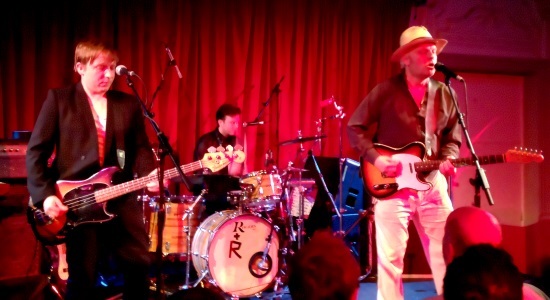 Nick Parker and his backing band The False Alarms, which features many of the musicians on this album, will be performing later this month at the Glastonbury Festival 2014. 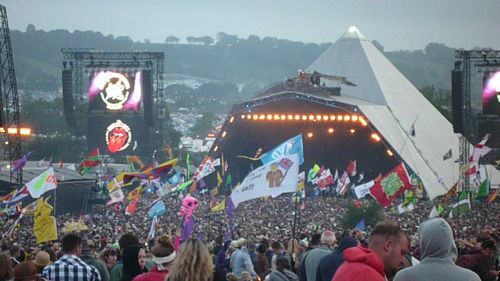 Away from the Pyramid and The Other Stage, the Glastonbury Festival offers an array of venues of all sizes, packed full of emerging talent and more well known bands looking for a more intimate gig. From the Leftfield Tent, where Billy Bragg helps curate a political and talented musical line up, to the BBC Introducing Stage, where regional radio DJs showcases their favourite local acts, there is plenty to see away from the BBC cameras. For the third year running we will be attending and have compiled this list of our recommended acts away on some of the festival’s smaller stages, with West Holts and Park Stage the largest we will focus on. In our list we have an Emerging Talent competition winner, one of Somerset’s best bands as well as more familiar names that are performing at the festival for the first time or are back again after impressing before. So for those looking to avoid the stadium rock of Metallica and Kasabian here is our pick of the ten must see acts across the festival site. For the second year running we were delighted to be among the judges for the Glastonbury Festival Emerging Talent competition. This year’s deserved winners put in an incredible set during the finals in April in nearby Pilton, Somerset, and we are keen to see much more of their exciting, fun and packed full of humour take on pop music when they open Sunday‘s proceedings at West Holts. Everyone we recommend Grant to turns round and says “wow!” Yes, he’s that good and has that much of a wide appeal. 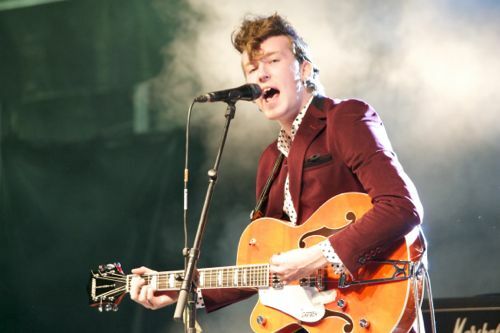 Across his two albums Queen of Denmark and Pale Green Ghosts, Grant has emerged as an excellent song writer and performer and is part of an impressive line up at the Park Stage this year. He is due on around 9pm on Saturday night. 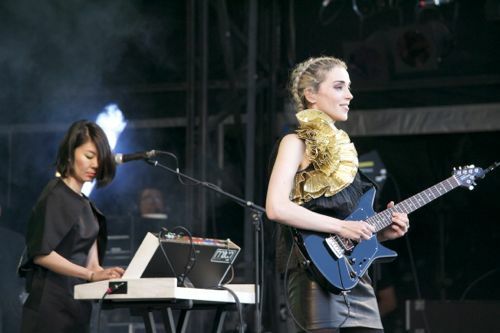 We stick with the Park Stage with our next recommendation, art rockster St Vincent. Her collaborations with David Byrne and Andrew Bird left us impressed and so too has her recent self titled album. Judging by her live performances recently The Park Stage crowd are in for a treat on Sunday evening. Crazy dance music and pop backed by clips from wartime information films has proved a winning conceit for Public Service Broadcasting duo, J. Willgoose Esq and Wrigglesworth. We saw them at onef the smaller Glastonbury Festival stage William’s Green last year and they put in an exciting show, backed by a giant TV on stage and full of humour, with all banter carried out through pre-programmed robot responses. 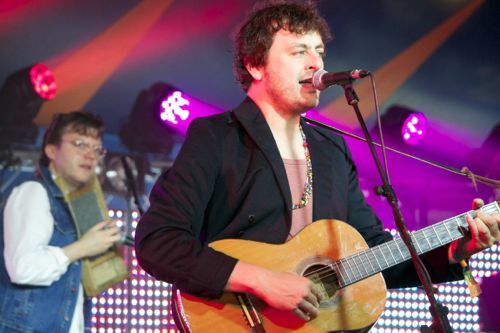 Their reward for last year’s excellent gig is a move to the far larger West Holts Stage on Sunday afternoon. Just as alternative guitar music looked to be in the doldrums up popped Parquet Courts last year with their Neonfiller.com Album of the Year, Light Up Gold. 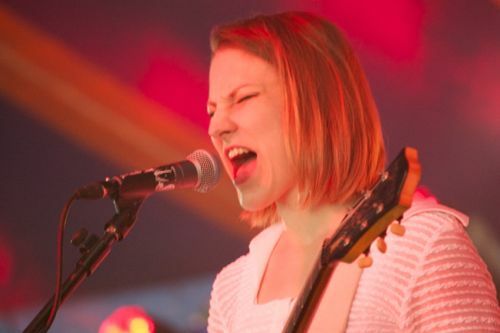 They have attitude in abundance with their exciting take on the music of Pavement, Wire and The Fall and are yet another excellent addition to The Park Stage’s Friday late afternoon line up. The Tuts were one of the highlights at last year’s Indietracks and we are delighted that they’ve secured a Friday evening slot at the Leftfield Tent this year. Appearing on the Friday evening they ooze pop appeal and are a slick bunch live, thanks to a support slot on Kate Nash’s tour last year. They kindly let us use their song Tut Tut for this video diary we made for last year’s Indietracks festival. 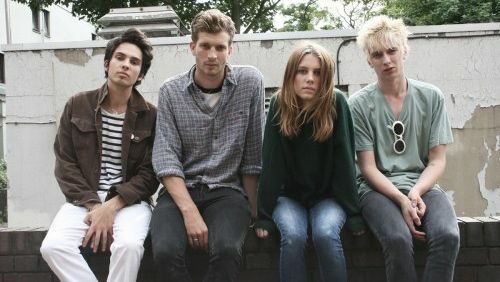 Another band to impress us at another festival, is Wolf Alice, a highlight of 2013’s The Great Escape. We predict they will be one of the most talked about of the John Peel stage’s acts, where further acclaim beckons. We also named them as one of out Top Ten Bands to Watch Out for in 2014 and guarantee you won’t be disappointed. They are due on stage around 4pm on the Saturday. We’ve been banging on about this London folk rock band for years now, after seeing them at Glastonbury and Great Escape in 2011. Live they put on an incredible show both times and are tailor made for a festival crowd with their big sound and stage presence. Be sure to catch their set when they take to the John Peel Stage on Sunday afternoon. Formerly based in London now of Glastonbury, the town that is, they are one of the Festival area’s best local acts and with a national following as well. They blend a range of genres from folk to rock to pop to ska, but above all they are fun and are a great live act full of invention. In recent year’s they’ve even teamed up with Specials man Neville Staples and are due to perform at the Bandstand around 7pm on the Friday and are penciled in for around 11pm at the Avalon Cafe on the same night. How good are Young Knives live? Very much so, according to two of our reviewers who saw them on their own headline slot in Brighton this year as well as supporting The Flaming Lips in May. 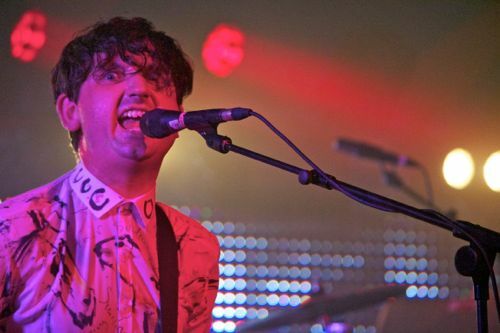 The fact that they nabbed the Lips support gig proves they are a force to be reckoned with on stage. Fun, quirky, inventive are just some of the adjectives we have used to describe this Leicestershire trio. Pop along and see them at the small but wonderful William’s Green stage early Friday evening. To plan your festival Clash Finder have this useful timetable with stage times filling up as the get confirmed. Just why aren’t Glasgow’s The Phantom Band one of the UK’s biggest acts, topping festival bills and spending their days off hanging gold discs in their mansions? Three albums in the critical accolades continue but still success eludes them. Listening to Strange Friend really puts their surprising lack of fame up until now into perspective. Musically there is no reason why this can’t be a top ten selling album this year. It’s packed full of stadium sized indie rock, but with lashings of quirky twists, turns and vintage synths along the way to retain credibility. This is a big album in sound and just seems out of kilter with the seemingly small band that are promoting it’s release with just four dates, all in small venues such as London’s Hoxton Bar and Grill. It is also not the album of a band that has been honing its trade since 2006 but still only has less than 4,000 Twitter followers in the social media age. If I was an executive at Chemikal Underground I’d be pulling out all the stops to get this band the audience it’s wonderful music deserves. Take third track Doom Patrol. Its got a huge sound and melody, perfect for say the Pyramid Stage at Glastonbury, but also with clever ‘80s synths to appeal to a mass audience and snobby music bloggers like me in equal measure. Then there’s their star turn, singer Ricky Anthony’s beautiful and heavily Scottish accented vocals. At times it’s akin to Neil Hannon, deep and velvety, such as on opener The Wind That Cried The World. Then he takes his deep vocals in an entirely darker direction on the stripped back Atacama, in which he does this year’s best Bill Callahan impression. The album is rich full of influences from across the generations that combine to create a sound that is wholly unique, as they blend 70s and 80s electronica, kraut rock and modern pop and rock in an inventive as well as crowd pleasing way. So for how long will The Phantom Band remain a secret friend to their small fan base? Possibly not much longer. 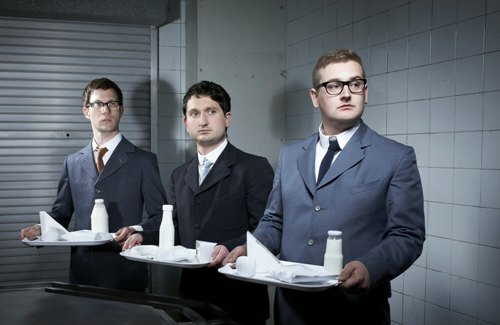 The band have Tweeted on June 3 that they have made it into the midweek album charts (ending June 9) sandwiched between Katy Perry and One Direction. Could it be that finally the world has come to its senses and stellar success beckons for The Phantom Band. We hope so as this is an album and a band that deserve far wider attention.